Glaucoma is the name given to a group of eye diseases associated with too much pressure inside one or both eyeballs. It is a leading cause of blindness. Increase in intraocular pressure results in damage to the optic nerve that connects the eye to the brain. This damage is permanent. Surgery is an effective and proven form of treatment. It may be recommended if the medication is not working, the glaucoma is worsening or the patient is unable to take medication. We may use a laser, which can be performed in the rooms. A laser procedure typically takes about 15 minutes. Incisional surgery is usually done in a hospital or day-procedure clinic. It typically takes about one hour. 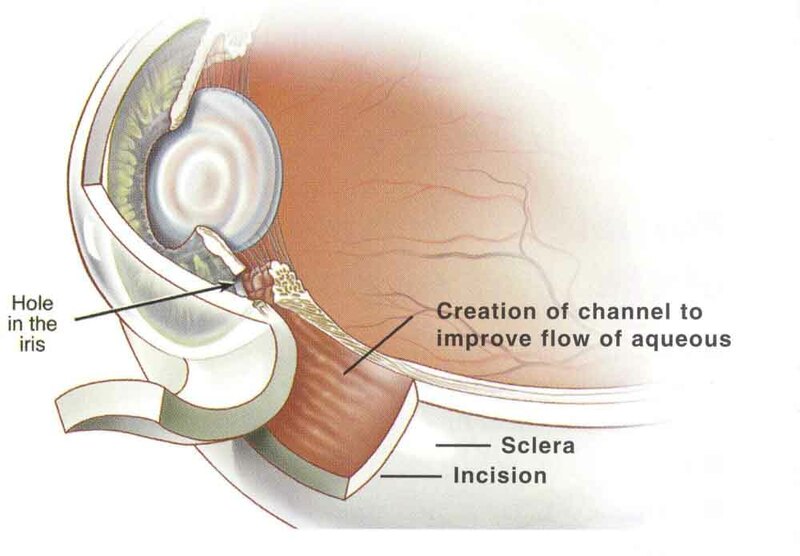 The most common surgery to treat glaucoma is called a trabeculectomy, we create a channel through the wall of the eyeball (the sclera) near the trabecular meshwork. This lets the aqueous slowly drain out of the eye. This is not a natural channel, and the eye may seal it by normal healing process. The recovery period after glaucoma surgery is unpredictable. Frequent visits may be required in the two weeks after surgery. Drops are to be used for a few weeks after surgery. Sometimes, anti-scarring injections to the surface layer of the eye may be needed. The sutures are often cut by means of a laser to increase filtration. The need for further surgery and/or medication.